This article is about unit of area measure. For other uses, see Acre (disambiguation). The acre is a unit of land area used in the imperial and US customary systems. It is traditionally defined as the area of one chain by one furlong (66 by 660 feet), which is exactly equal to 10 square chains, ​1⁄640 of a square mile, or 43,560 square feet, and approximately 4,047 m2, or about 40% of a hectare. Based upon the International yard and pound agreement of 1959, an acre may be declared as exactly 4,046.8564224 square metres. The acre is a statute measure in the United States and was formerly one in the United Kingdom and almost all countries of the former British Empire, although informal use continues. In the United States both the international acre and the US survey acre are in use, but they differ by only two parts per million: see below. The most common use of the acre is to measure tracts of land. Traditionally, in the Middle Ages, an acre was defined as the area of land that could be ploughed in one day by a yoke of oxen. One acre equals ​1⁄640 (0.0015625) square mile, 4,840 square yards, 43,560 square feet or about 4,047 square metres (0.4047 hectares) (see below). While all modern variants of the acre contain 4,840 square yards, there are alternative definitions of a yard, so the exact size of an acre depends on which yard it is based. Originally, an acre was understood as a selion of land sized at forty perches (660 ft, or 1 furlong) long and four perches (66 ft) wide; this may have also been understood as an approximation of the amount of land a yoke of oxen could plough in one day. A square enclosing one acre is approximately 69.57 yards, or 208 feet 9 inches (63.61 metres) on a side. As a unit of measure, an acre has no prescribed shape; any area of 43,560 square feet is an acre. In the international yard and pound agreement of 1959 the United States and five countries of the Commonwealth of Nations defined the international yard to be exactly 0.9144 metres. By inference, an "international acre" may be declared as exactly 4,046.8564224 square metres but it does not have a basis in any international agreement. Both the international acre and the US survey acre contain ​1⁄640 of a square mile or 4,840 square yards, but alternative definitions of a yard are used (see survey foot and survey yard), so the exact size of an acre depends upon which yard it is based. The US survey acre is about 4,046.872609874252 square metres; its exact value (4046 13,525,426/15,499,969 m2) is based on an inch defined by 1 metre = 39.37 inches exactly, as established by the Mendenhall Order. Surveyors in the United States use both international and survey feet, and consequently, both varieties of acre. Since the difference between the US survey acre and international acre is only about a quarter of the size of an A4 sheet of paper (0.016 square metres, 160 square centimetres or 24.8 square inches), it is usually not important which one is being discussed. Areas are seldom measured with sufficient accuracy for the different definitions to be detectable. The acre is commonly used in a number of current and former Commonwealth countries by custom, and in a few[which?] it continues as a statutory measure for legal transactions. These include Antigua and Barbuda, American Samoa, The Bahamas, Belize, the British Virgin Islands, the Cayman Islands, Canada, Dominica, the Falkland Islands, Grenada, Ghana, Guam, the Northern Mariana Islands, Jamaica, Montserrat, Samoa, Saint Lucia, St. Helena, St. Kitts and Nevis, St. Vincent and the Grenadines, Turks and Caicos, the United Kingdom, the United States and the US Virgin Islands. In India, residential plots are measured in square feet while agricultural land is measured in acres. In Sri Lanka, the division of an acre into 160 perches or 4 roods is common. In Sindh (Pakistan), residential plots as well as open/agriculture land measurement is in Acres, Jareb, Wiswa and Gunta. Its use as a primary unit for trade in the United Kingdom ceased to be permitted from 1 October 1995, due to the 1994 amendment of the Weights and Measures Act, where it was replaced by the hectare – though its use as a supplementary unit continues to be permitted indefinitely. This was with exemption of Land registration, which records the sale and possession of land, in 2010 HM Land Registry ended its exemption. The measure is still used to communicate with the public, and informally (non-contract) by the farming and property industries. The area of one acre (red) superposed on an American football field (green) and Association football/soccer pitch (blue). Perhaps the easiest way for US residents to envision an acre is as a rectangle measuring 88 yards by 55 yards (​1⁄10 of 880 yards by ​1⁄16 of 880 yards), about ​9⁄10 the size of a standard American football field. 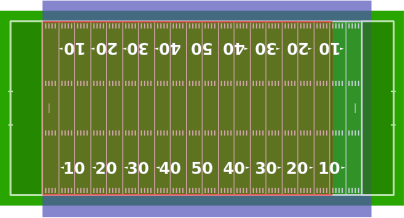 To be more exact, one acre is 90.75% of a 100-yd-long by 53.33-yd-wide American football field (without the end zone). The full field, including the end zones, covers about 1.32 acres (0.53 ha). For residents of other countries, the acre might be envisioned as rather more than half of a 1.76 acres (0.71 ha) Association football (soccer) pitch. It may also be remembered as 1% short of 44,000 square feet. The rod is a historical unit of length equal to ​5 1⁄2 yards. It may have originated from the typical length of a mediaeval ox-goad. There are 4 rods in one chain. The furlong (meaning furrow length) was the distance a team of oxen could plough without resting. This was standardised to be exactly 40 rods or 10 chains. An acre was the amount of land tillable by one man behind one ox in one day. Traditional acres were long and narrow due to the difficulty in turning the plough and the value of river front access. An oxgang was the amount of land tillable by one ox in a ploughing season. This could vary from village to village, but was typically around 15 acres. 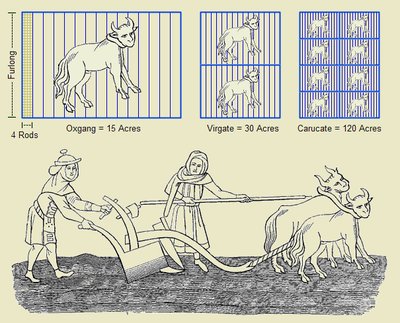 A virgate was the amount of land tillable by two oxen in a ploughing season. A carucate was the amount of land tillable by a team of eight oxen in a ploughing season. This was equal to 8 oxgangs or 4 virgates. The word "acre" is derived from Old English æcer originally meaning "open field", cognate to west coast Norwegian ækre and Swedish åker, German Acker, Dutch akker, Latin ager, Sanskrit ajr, and Greek αγρός (agros). In English, it was historically spelled aker. It is ordained that 3 grains of barley dry and round do make an inch, 12 inches make 1 foot, 3 feet make 1 yard, 5 yards and a half make a perch, and 40 perches in length and 4 in breadth make an acre. The acre was roughly the amount of land tillable by a yoke of oxen in one day. 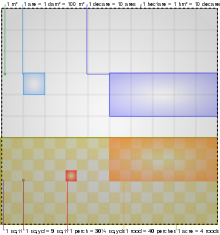 This explains one definition as the area of a rectangle with sides of length one chain and one furlong. A long, narrow strip of land is more efficient to plough than a square plot, since the plough does not have to be turned so often. The word "furlong" itself derives from the fact that it is one furrow long. Queen Victoria – the British Weights and Measures Act of 1878 defined it as containing 4,840 square yards. Historically, the size of farms and landed estates in the United Kingdom was usually expressed in acres (or acres, roods, and perches), even if the number of acres was so large that it might conveniently have been expressed in square miles. For example, a certain landowner might have been said to own 32,000 acres of land, not 50 square miles of land. The acre is related to the square mile, with 640 acres making up one square mile. One mile is 5280 feet (1760 yards). In western Canada and the western United States, divisions of land area were typically based on the square mile, and fractions thereof. If the square mile is divided into quarters, each quarter has a side length of ​1⁄2 mile (880 yards) and is ​1⁄4 square mile in area, or 160 acres. These subunits would typically then again be divided into quarters, with each side being ​1⁄4 mile long, and being ​1⁄16 of a square mile in area, or 40 acres. In the United States, farmland was typically divided as such, and the phrase "the back 40" would refer to the 40-acre parcel to the back of the farm. Most of the Canadian Prairie Provinces and the US Midwest are on square-mile grids for surveying purposes. Customary acre – The customary acre was a measure of roughly similar size to the acre described above, but it was subject to considerable local variation similar to the variation found in carucates, virgates, bovates, nooks, and farundels. However, there were more ancient measures that were also farthingales. These may have been multiples of the customary acre, rather than the statute acre. Builder's acre – In US construction and real estate development, an area of 40,000 square feet. Used to simplify math and for marketing, it is nearly 10% smaller than a survey acre. God's Acre – a synonym for a churchyard. Long acre – the grass strip on either side of a road that may be used for illicit grazing. ^ "Manuscripts and Special Collections - Measurements". the University of Nottingham. Retrieved 1 August 2018. ^ Klein, Herbert Arthur (3 December 2012). The Science of Measurement: A Historical Survey. Courier Corporation. p. 76. ISBN 978-0-486-14497-9. Retrieved 29 June 2015. ^ National Bureau of Standards. (1959). Refinement of Values for the Yard and the Pound. ^ National Geodetic Survey, (January 1991), "Policy of the National Geodetic Survey Concerning Units of Measure for the State Plane Coordinate System of 1983. ^ "Gov't Gifts 'Bakka' With Half-Acre Land | Antigua Observer Newspaper". web.archive.org. Archived from the original on 4 October 2013. Retrieved 14 February 2014. ^ "National Park of American Samoa completes two successful forest projects | Samoa News". SamoaNews.com. Retrieved 14 February 2014. ^ Lowe, Alison (15 August 2013). "Construction underway on Old Fort School". The Nassau Guardian. ^ "2,225-acre Cobia farm proposed near Lark and Bugle Cayes | Amandala Newspaper". amandala.com.bz. Retrieved 14 February 2014. ^ "Work continues on development". bvibeacon.com. Retrieved 14 February 2014. ^ "Kai drama over 50-acre development :: cayCompass.com". compasscayman.com. Retrieved 14 February 2014. ^ "Canada Farms and Ranches for sale, Canada Acreage for Sale, Canada Lots for Sale at LandWatch.com". landwatch.com. Retrieved 16 January 2016. ^ "Dominica not meeting quota for international banana markets | Dominica News Online". dominicanewsonline.com. Retrieved 14 February 2014. ^ "Farm Yarns with Elaine – Farm yarns with Elaine Turner – Part 13". penguin-news.com. Archived from the original on 24 September 2015. Retrieved 14 February 2014. ^ "Grenada Broadcast – George Grant – THE GRENADA SPICES INDUSTRY". grenadabroadcast.com. Archived from the original on 4 October 2013. Retrieved 14 February 2014. ^ Ofori-Atta, Prince. "Mortgages in Ghana: Snapping up an acre of Accra real estate". www.theafricareport.com. Retrieved 31 March 2018. ^ "Local News | Pacific Daily News". guampdn.com. Archived from the original on 1 October 2013. Retrieved 14 February 2014. ^ "Islan Pagan". saipantribune.com. Archived from the original on 17 October 2013. ^ "Beresford Allen of St. Peters Montserrat is a Wanted Man! | The Montserrat Reporter". themontserratreporter.com. Retrieved 14 February 2014. ^ "Conflicting stories about Nu'u estate". samoaobserver.ws. Retrieved 14 February 2014. ^ "The Voice – The national newspaper of St. Lucia since 1885". thevoiceslu.com. Archived from the original on 4 October 2013. Retrieved 14 February 2014. ^ "FEATURE: We built an island dream on our own St Helena | St Helena Online". sthelenaonline.org. Archived from the original on 21 October 2013. Retrieved 14 February 2014. ^ "SIDF Sinks SKN Passport Money into Christophe Harbour :: The St. Kitts-Nevis Observer". thestkittsnevisobserver.com. Archived from the original on 4 October 2013. Retrieved 14 February 2014. ^ "PM vows to spend rest of life seeking reparations – I-Witness News". iwnsvg.com. Retrieved 14 February 2014. ^ "Government gets $8million from Emerald Cay sale". suntci.com. Retrieved 14 February 2014. ^ "Proposed dolphin facility will enclose about 2 acres of Water Bay – News – Virgin Islands Daily News". m.virginislandsdailynews.com. Archived from the original on 22 October 2013. Retrieved 14 February 2014. ^ a b "Explanatory memorandum to The weights and measures (metrication amendments) regulations 2009" (PDF). Legislation.gov.uk. 2009. ^ "Land Registration Act 2002". legislation.gov.uk. UK: The National Archives. 2002. Retrieved 3 August 2018. ^ "Outlook and historical context". Savills. 12 February 2018. ^ "Amount of UK farmland put up for sale shrinks as prices fall". Financial Times. 13 February 2018. ^ "Land for Sale". farminguk. ^ "acre, n.". Oxford English Dictionary. December 2011. ^ Wüsten, Menschen und Geschichte. Bei: woiste.de. ^ Holland, Robert. (1886). A glossary of words used in the County of Chester. London: Trübner for the English Dialect Society. p. 3. ^ a b Malcolm, Noel (1999). Kosovo: A Short History. Harper Perennial. ISBN 978-0-06-097775-7. ^ "God's Acre – Definition of God's acre by Merriam-Webster". Wikisource has the text of the 1911 Encyclopædia Britannica article Acre (land measure). Cockeyed.com presents "How much is inside an acre?"